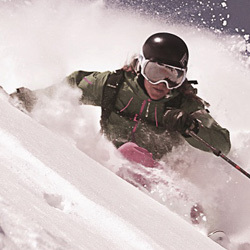 Blizzard, a leading ski manufacturer based in Austria, was looking for an industrial automation solution to extend manufacturing visibility and control across their five machine production stations. In addition to utilising existing hardware, the industrial solution needed to collect Key Performance Indicator (KPI) data and send Andon messages from key production equipment as well as display profitability metrics in the production hall. 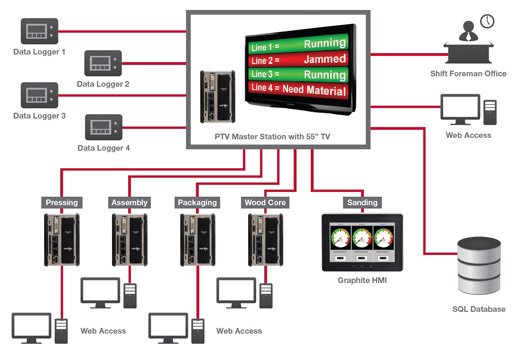 With support for over 300 industrial protocols, multiple communication ports and a display output, the Red Lion ProducTVity Station is a visual management system that collects real-time data and performance metrics from Blizzard’s manufacturing operations. ProducTVity Stations were installed along with a local PC at Blizzard’s wood core, pressing, assembly and packaging stations to collect KPI data for current piece count and nominal piece count for the current work period. These metrics are displayed on a production scoreboard, via a television that can be viewed by employees and management. A rugged Red Lion Graphite HMI was also installed at the sanding station to enable easy touchscreen input in a rugged, dusty environment. The Red Lion solution enables Blizzard to increase production output and minimise equipment downtimes. By adding a visual management scoreboard to the Blizzard production hall, the manufacturing team is now able to see graphical representations of real-time production data. This data includes completed and target piece count metrics from five wood working, sanding, pressing, assembly and packaging machine production stations. Easy at-a-glance visual access to this information allows personnel to proactively monitor and manage each station to meet production goals and better support downstream operations. In addition to production metrics, it also displays the status of the manufacturing equipment. Operators or maintenance engineers can quickly see, and react, if a machine is operational, being resupplied or out of service based on the icon and colour associated with the equipment on the display. With this form of visual management, Blizzard expects to achieve a greater degree of transparency regarding overall production activity. If you are looking for more information about the Red Lion PTV or Graphite HMIs, you can download the product information and whitepapers on the right. You can also call us on 01254 685900 and speak to one of our Sales or Technical Support Engineers about how the Red Lion PTV could improve your productivity. They will be happy to help or arrange a demo.